Donald Trump’s nationalist trade policies, including his recent decision to impose tariffs on imported steel and aluminum, have stirred debate on the Left. For years, progressives have argued that neoliberal globalization destroys jobs and worsens inequality in the US and around the world. If that’s true, why wouldn’t it make sense to protect domestic industries like steel and aluminum, where jobs have been lost? Notwithstanding their many other objections to Trump, shouldn’t progressives endorse his nationalistic policies on the grounds that they could help US industrial workers recoup lost jobs and wages? The progressive critique of globalization and trade deals has, in fact, received extensive validation in a number of recent studies by top economists. David Autor and Daron Acemoglu of MIT, along with a series of co-authors, have found strong statistical evidence confirming that the “shock” of increased imports from China caused massive job losses (up to 2.4 million) and significantly depressed wages for US workers, especially those with less education. Chinese imports, they found, have affected workers not only in the manufacturing industries that directly compete with imports, but also in local service sectors that serve communities impacted by the imports, as well as “upstream” industries that supply inputs to the import-competing firms. Estimates from Robert E. Scott of the Economic Policy Institute show even larger job displacement due to higher US trade deficits with Mexico and China. Whichever estimates one believes, free-trade advocates who ignore or deny these huge social costs have clearly brought the current wave of anti-trade backlash on themselves. It’s true that steel is an extreme case in this regard — trade has been a bigger factor in job losses in other industries, such as apparel and automobiles — but it’s a sector where protection is least likely to bring back most of the jobs of the past. It is also true that the global steel market suffers from chronic excess capacity, due in large measure to huge increases in production capacity, much of it subsidized, in China and certain other exporting nations. The resulting downward pressure on world steel prices has put many steel firms in jeopardy, or out of business, in the US and other relatively open economies. But with only small amounts of direct US imports of steel from China (less than 3 percent of steel imports in 2017, down from 6 percent in 2015 as a result of existing tariffs), Trump’s new tariffs — unless he issues enough exemptions — will fall mainly on economies like Canada and the European Union, which don’t subsidize their steel, plus a few alleged “unfair traders” in steel such as Russia and Brazil. At best, threatening such countries with tariffs might conceivably induce them to join in an effort to negotiate with China to rein in excess capacity, as advocated by Robert E. Scott. But it’s an odd way to treat friends or win cooperation. If the goal is to reduce the US trade deficit, the best approach would be to combat the dollar’s overvaluation, which hurts US exporters and encourages imports — not to adopt tariffs that benefit some industries at the expense of others. It’s also possible under international law to impose across-the-board tariffs (i.e., duties that don’t discriminate between industries or countries) for balance-of-payments purposes, and I have previously advocated consideration of such tariffs as a lever to bargain down the value of the dollar and prod surplus countries like China to expand their domestic demand. But steel tariffs don’t cut the mustard for this purpose. The Trump administration has justified its steel and aluminum tariffs by using a Cold War relic: a 1962 law that gives the president almost unlimited authority to impose tariffs on national security grounds. But there is no credible case that the US steel and aluminum industries cannot supply enough of these products for any conceivable national security crisis. Trump has already granted temporary exceptions for Canada and Mexico (intended as a bargaining chip to get them to accede to his demands in the NAFTA renegotiation) and offered to exempt other countries in exchange for reciprocal concessions. If revitalizing the country’s steel industry is truly a national security objective, it’s hard to see how tariffs that are imposed or withdrawn based on presidential whim and other negotiations would encourage steel companies to make long-term investments in new facilities. On the other hand, it’s important not to give too much credence to the doomsday predictions of free traders who warn that tariff-induced increases in steel prices will destroy large numbers of jobs in downstream, steel-using industries like automobiles and construction. While it’s true that there are far more jobs in downstream industries than in steel itself, the impact of higher steel prices on employment in such industries will probably be limited, and prices in any case may not rise by nearly as much as the 25 percent tariff rate suggests. Some downstream products could become less competitive, leading to increased imports in some sectors. But if more steel is produced domestically, there will also be some additional jobs created in industries that supply inputs for steel-making and those that serve local communities where steel mills are located — and such jobs will offset some of the possible losses in downstream sectors. Ultimately, employment in these other sectors will depend far more on demand for their products than on changes in steel costs. Another outcome that is far from certain is the prospect of a “trade war.” Free traders are issuing hysterical cries that US steel and aluminum tariffs will lead to massive retaliation by other countries. Having learned how the US political system works, foreign countries are threatening retaliatory duties on US exports from politically sensitive states, such as motorcycles from Speaker Paul Ryan’s home state of Wisconsin and bourbon from Senate Majority Leader Mitch McConnell’s home state of Kentucky. But to do this legally, those countries must first ask the World Trade Organization (WTO) to declare the US tariffs illegal or else engage in safeguard tariff investigations, either of which takes time. US exporters could eventually suffer, especially if other countries impose tariffs on major exports like corn and jet airplanes. But so far, Trump’s tariffs cover only a small fraction of US imports and we are still very far from an all-out trade war. However, one effect of the tariffs is clear: to the extent that steel prices do rise, it will increase profit margins for US-based steel companies — and those companies will be under no obligation to raise their workers’ wages or invest in expanded domestic steel facilities. It’s no wonder that former steel executives like Commerce Secretary Wilbur Ross and Trump adviser Dan DiMicco are enthusiastic about the tariffs: their friends and cronies will reap the lion’s share of the gains. 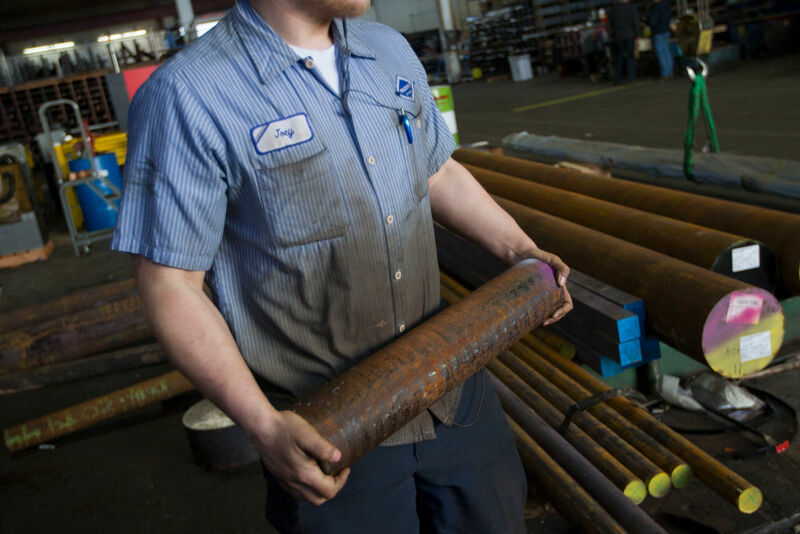 Meanwhile, downstream companies that purchase steel — including construction companies and machinery manufacturers — will face higher steel costs, which could squeeze their profit margins. This is a battle between rival industrial interests; progressives should not be taking sides. Moreover, Trump’s tariffs aren’t accompanied by any kind of strategy for industrial revitalization or regional development in areas adversely impacted by trade and offshoring. Aside from the tariffs, the only “strategy” the Trump administration offers is lower tax rates for corporations and the rich, along with deregulation in every conceivable area: labor standards, consumer safety, environmental protection, and so on. At best, this is a recipe for the creation of small numbers of low-wage jobs under unsafe working conditions and with destructive environmental and health side effects. A true US industrial revitalization would require the exact opposite of the Trump administration’s domestic policies. The government would have to plow significant resources into technological research, scientific education, and worker training to develop the industries of the future. The country needs massive public investment in infrastructure, financed by trillions of dollars of federal spending — not by sending the bill to state and local governments or privatizing infrastructure as the Trump administration is proposing. The US needs to address global warming by developing renewable energy, including solar and wind power, to replace carbon-based fuels. It also needs to reverse the class warfare that has redistributed income upward and concentrated power in the hands of billionaires. Taken together, these kinds of policies would create far more employment than Trump’s tariffs — including in sectors like steel that would supply key inputs. Versions of such a program have been advocated by a range of progressive economists and commentators, including Harvard economist Dani Rodrik, Nobel laureate Joseph Stiglitz, and economic journalist and Brandeis professor Robert Kuttner. There are some differences: Kuttner is more willing to use trade interventions than Stiglitz; Rodrik is somewhere in the middle. But in the absence of such a policy agenda being adopted, progressives should not play into Trump’s hands by supporting tariffs enacted on fake national security grounds in support of a reactionary policy agenda that is utterly destructive of working-class interests. Robert A. Blecker is a professor of economics at American University, Washington, D.C. and a research associate of the Economic Policy Institute.